account for almost 70% of all FA cases and that about 40% of the mutations in this gene are large deletions; therefore, the search usually starts with a screen for deletions in FANCA. However, depending on the circumstances, strategies may differ from case to case, as outlined below. FANCA: 1263delF occurs in about 5% of all FA-A cases, whereas Exon11-17del and Exon12-31del occur relatively frequently in Afrikaans-speaking people in South Africa (cited in Ref. ). FANCC: IVS4 + 4A > T occurs homozygously in 80% of FA patients of Ashkenazi Jewish ancestry and is associated with a severe phenotype. The exon 1 frameshift 322delG, associated with a relatively mild phenotype, is homozygously present in about 50% of FA cases in the Netherlands. [13,19] FANCG: L105X is relatively common in FA-G cases in Germany. 2. In the absence of any clue, systematic mutation screening should start with a search for deletions in FANCA, because this gene is most often mutated, 40% of all mutations being large deletions. 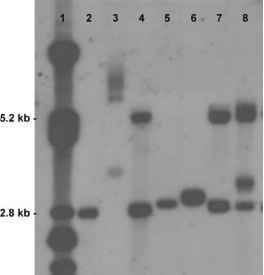 The quantitative multiplex ligation-dependent probe amplification (MLPA) method is used for this initial screen. 3. If negative by MLPA, HPLC under denaturing conditions, followed by direct sequencing of aberrant fragments, is used to screen for mutations in FANCA, -C, -E, -F, -G, and -L simultaneously. Minor sequence variations, such as missense mutations or in-frame microdeletions or -insertions, should be tested for pathogenicity in a cellular transfection assay to check the capacity of the variant gene product for complementing activity (e.g., Ref. ). 4. If negative again, FANCD2 is sequenced. This is done at the level of cDNA, because pseudogenes complicate the interpretation of genome-derived sequences. Seemingly minor alterations should be tested for pathogenicity in a transfection assay. 5. If again negative, BRCA2 is screened by denaturing gradient gel electrophoresis (DGGE) and sequencing. Minor alterations should be tested for pathogenicity by a complementation test. 7. If the patient has been excluded from all groups for which the disease gene is known, further work to assign the patient to a complementation group (B, I, J, or a new group) is undertaken on a research basis.